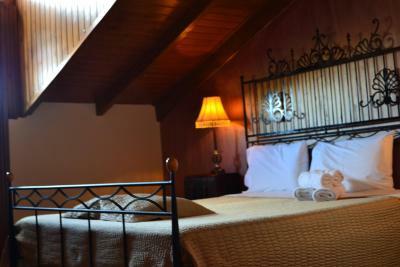 Lock in a great price for Pension Anapli – rated 8.5 by recent guests! Location is close to the old city. Balcony was nice. Staff was friendly and helpful. 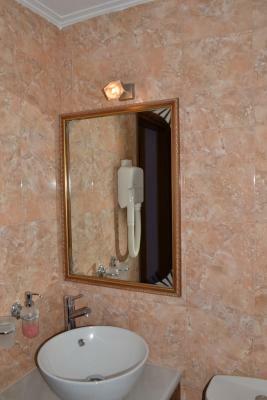 The location is ideal, room was clean and spacious with a view. The Pension Anapli was a wonderful smaller hotel. The building was historic and had tons of charm. 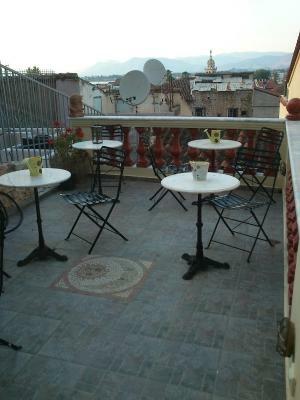 Great location; easy to walk anywhere in the old town. Beautiful city with lots of things to see. 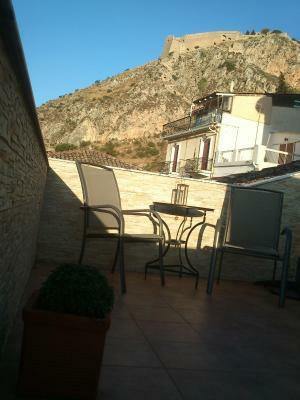 Very characterful.property with lovely views from top floor room's terrace. In the old area and convenient for visiting fort and the great town beach! The bed was very comfortable and the air-conditioning excellent. 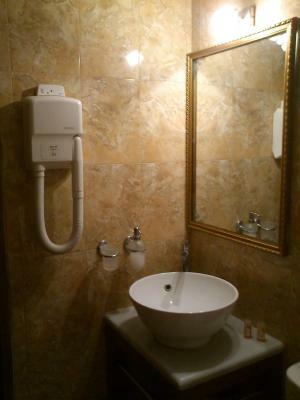 The bathroom was clean with a powerful shower, with plenty of hot water. The staff were charming and helpful. The breakfast a good continental one. Our dog was welcomed. I think that this little pension is perfect for a couple on a romantic holiday - as long as they are not too tall. Location was excellent and helpful, friendly staff. 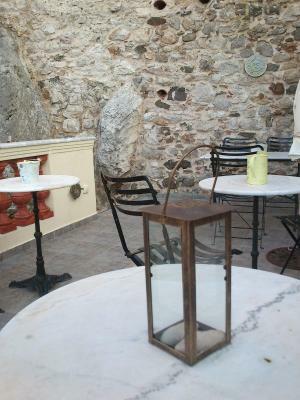 Wonderfully characteristic part of Nafplion, slightly up and behind the central square and waterfront, but a mere three minutes' walk away. 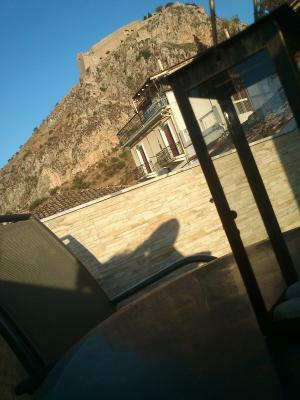 Spectacular view of Palamidi Fortress from the front room, helpful staff when we accidentally broke the key in the lock! The breakfast is fairly small, there is not much choice. 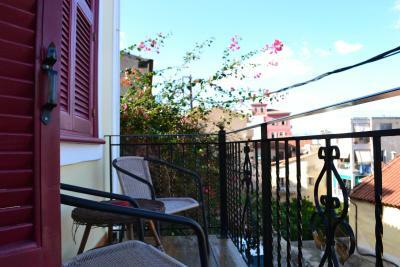 The recently refurbished Pension Anapli is set in a traditional 1820s building in the Old Town of Nafplion. Towered by Palamidi castle, the traditional hotel is just 650 feet from Arvanitia Beach. Constructed with local stone and wood, this boutique hotel offers uniquely styled rooms with city views. 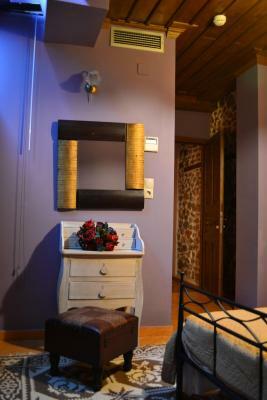 Each of Pension Anapli’s guest rooms is styled with bright colors and tasteful furnishings. Free Wi-Fi is available throughout the building, and rooms come with heating and air conditioning, a fridge and a plasma TV set. Breakfast is served daily at the seating area next to the reception. Many restaurants and cafes, as well as free public parking are available in the surrounding area. 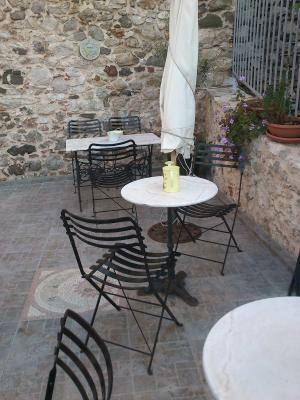 When would you like to stay at Pension Anapli? These traditionally styled rooms are fitted with iron or built beds and have a window with view of the garden. 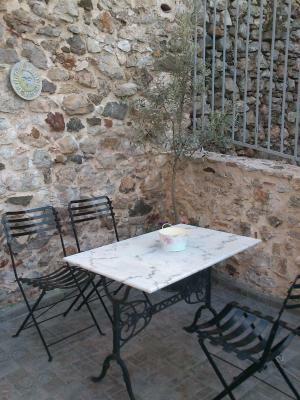 A communal terrace is available where you can have your breakfast and rest throughout the day. Superior rooms offer all standard amenities, plus extra space and a traditional, shared balcony with a view of the streets of the Old Town, the Palamidi Castle and the Clock Tower. 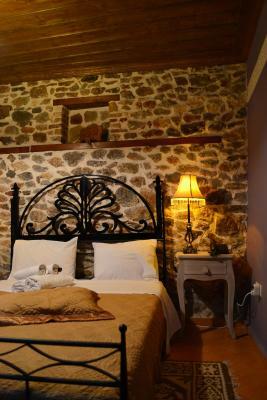 Traditionally styled room with stone-built walls, iron bed, extra sofa bed and wooden floors. 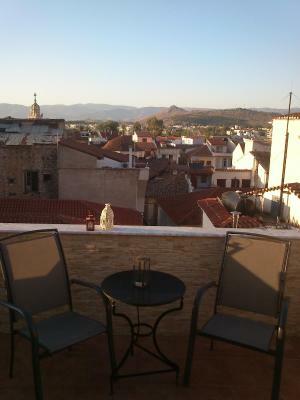 Its shared balcony overlooks the scenic streets of the Old Town or the Palamidi Castle. 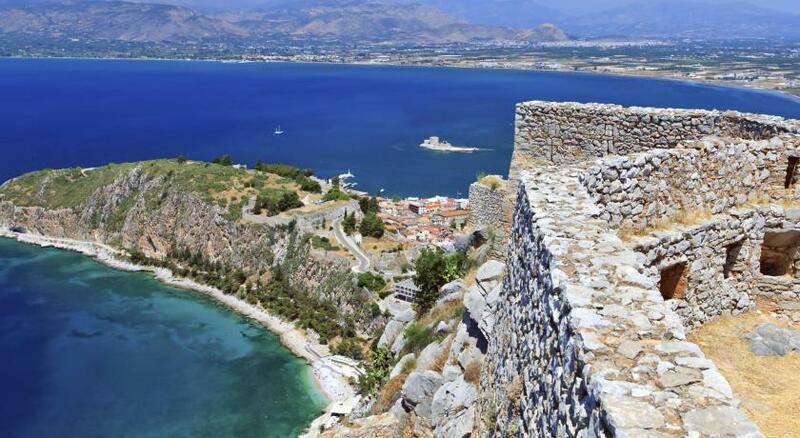 From Palamidi Castle, check out Nafplion’s fascinating old town all the way down to the sea. Follow its streets downhill, walk past Venetian residences and traces of the Ottoman era, and enjoy plenty of bars and restaurants. House Rules Pension Anapli takes special requests – add in the next step! Free! One child from 3 to 6 years stays free of charge when using existing beds. Pension Anapli accepts these cards and reserves the right to temporarily hold an amount prior to arrival. 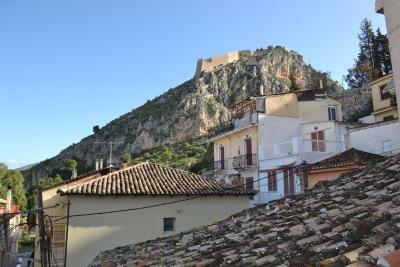 One of the most picturesque neighborhoods in Nafplio! The bed in our room was a little titled, so it was not so comfortable. Bathroom could have been cleaner. Breakfast was minimalistic and did not vary at all. Noises from other rooms were unfortunately heard very loud. Parking near to the location was problematic. The shower cubicle is very small and my tall husband found it a very tight squeeze! There were no tea/coffee making facilities or water in the fridge. Some hooks would have been handy for bags, towels, etc. The 25 steps up to the room were a struggle for older bones. Recycling bins would be an asset too. Three flights of stairs is a little painful but then you get a view of the castle from the balcony. 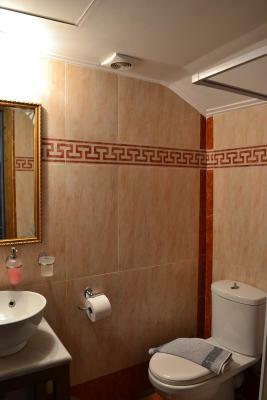 It's like nobody cares: The toilet quit flushing in the middle of the night. I found that the float was corroded and cleaned it, which fixed the problem, but I shouldn't have to do their plumbing. Further, the toilet seat was affixed to the toilet by only one of two bolts, causing the seat to wobble uncomfortably - presumably noticeable to cleaning staff. The Wi-Fi was sketchy at best, and the breakfast was just okay. Apparently, there was some sort of celebration in Napflio which included fireworks. It would have been nice if there had been a sign in the reception/breakfast area, or even better, if the receptionists had mentioned to their guests that we could view the fireworks from the hotel's upstairs terrace. Unfortunately, neither receptionist said anything, and the fireworks started while one of us in the shower and the other had gone to bed - we missed the whole thing. If you go by car: The hotel let us know that there is no parking on site: "free public parking is available at a location nearby; reservation is not possible." But parking availability depends on how busy the town is. When we arrived, we luckily got parking about three blocks away. However, the next night (a weekend) the closest open parking space we could find was many, many blocks away, toward the middle of the city. 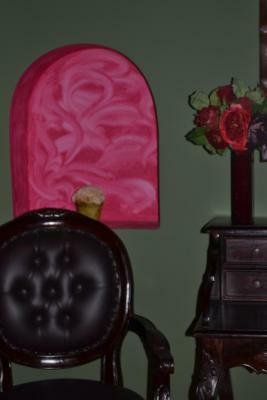 This hotel is not without its charm, as it doesn't have a cookie-cutter hotel layout; our room was built around a rocky wall! The toilet has flushing issues. We had to unplug the refrigerator at night as it was so noisy. Parking is tricky. Average breakfast. Amazing room, great location, gorgeous view, fluffy towels, the balcony made it for us! 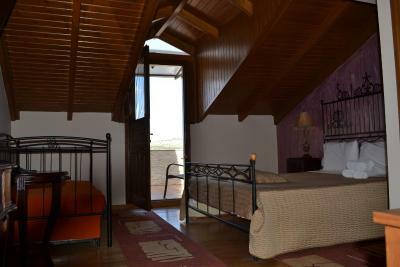 Wonderful place to stay, great room for family of three, welcoming hosts. Nafplio is beautiful and this place is truly special. The room had a strange smell probably because the circulation isn't really good. After the shower the water stayed really long inside the room.